See this thread by Natemoen who has graciously taken on the duty of getting more made, and reselling them to members. 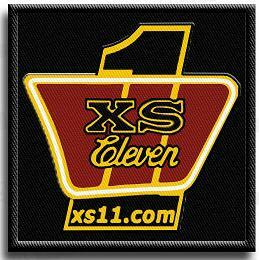 Great news, the new XS11.com logo patches have finally arrived, and I'm now taking orders for IMMEDIATE shipping!!! It is 3" x 3" square! Just log into Paypal, type in my email address: (SEE THREAD ABOVE) into the send money to window....just replace the (at) with @.